If you own a workbench or other flat surface that acts in the same way, a bench grinder is a versatile tool that can be used to shape, sharpen, and polish your other tools. The bench grinder consists of a machine that powers grind wheels that carry out your desired action. One of the things that sets this device apart is that there are numerous types of wheels that you can attach for whatever tasks you plan to take on. For instance, there are grinding wheels to sharpen a drill bit as well as wire brush wheels to do polishing. There are many things you are going to want to think over before you invest in a bench grinder for your garage or workshop. Choosing is the right wheel size is crucial because it determines both the work you are able to do and the speed you are able to do it at. As an example, an eight-inch wheel is going to move slower and is intended for use by professionals who have the need to do heavy-duty work. Six-inch wheels, on the other hand, are faster and work well for simple household tasks. You also want to think about speed variability, cooling systems, lighting attachments, safety guards, and more. Today, we will be going over nine of the best bench grinders on the market. We’ll also look into the things to consider before you make a purchase. By the time we’re done, you’ll be ready to find the perfect grinder for your needs. DeWalt DW756 6-Inch Bench Grinder 16.8 x 11.4 x 9.4 Inches 28.1 Pounds 6 Inch Check on Amazon! 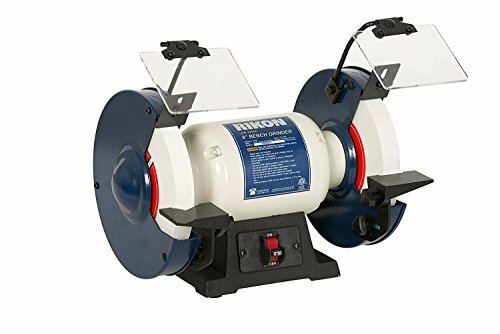 Rikon 8-Inch Slow Speed Bench Grinder 16.4 x 10.8 x 11.2 Inches 16.6 Pounds 8 Inch Check on Amazon! WEN 4276 6-Inch Bench Grinder 14 x 9.8 x 15 Inches 4 Pounds 6 Inch Check on Amazon! Powertec BGSS801 Slow Speed 8-Inch Bench Grinder 16 x 15 x 11 Inches 36.3 Pounds 8 Inch Check on Amazon! TruePower 199 Mini 3-Inch Bench Grinder 11 x 7 x 7 Inches 7.2 Pounds 3 Inch Check on Amazon! DEWALT DW758 8-Inch Bench Grinder 17.8 x 12.6 x 10.8 Inches 40.5 Pounds 8 Inch Check on Amazon! 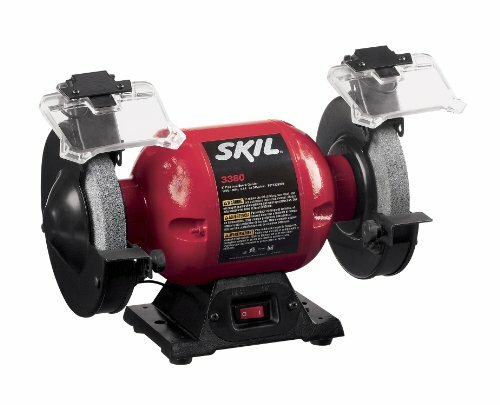 Skil 3380-01 6-Inch Bench Grinder 15.4 x 10.8 x 8.5 Inches 8.5 Pounds 6 Inch Check on Amazon! Powertec BF600 Heavy Duty 6-Inch Bench Buffer 20 x 10 x 9 Inches 19.8 Pounds 6 Inch Check on Amazon! 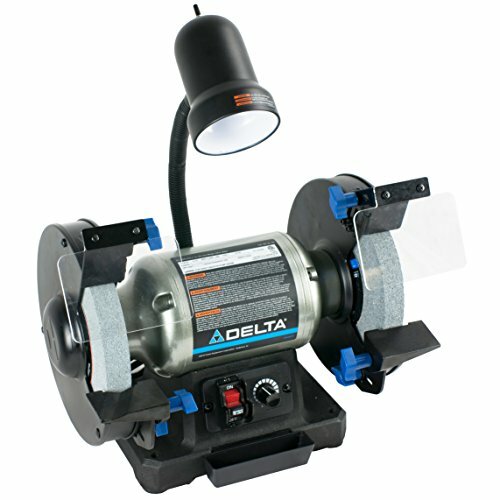 Delta Power Tools 23-197 8-Inch Variable Speed Bench Grinder 9.5 x 14.5 x 16.5 Inches 45.5 Pounds 8 Inch Check on Amazon! 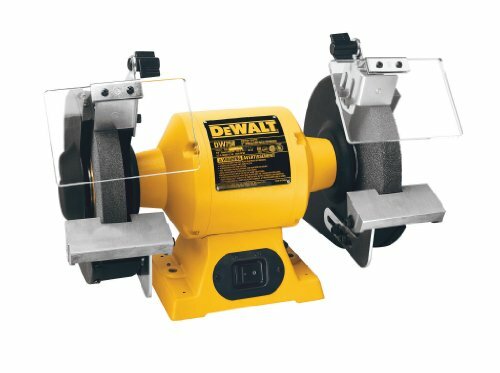 The DW756 bench grinder by DeWalt is a sturdy option with the power to handle any job you put in front of it. The durability and power make it the go-to options when you have a tough job to tackle, and you will see a long lifespan that other models may not be able to offer. This model offers integrated safety features to keep you protected during work. The motor on this model is a 5/8 horsepower induction that can offer up to 3,450 RPMs of power. You might be surprised to see the power this grinder can provide with only a 6-inch wheel. This bench grinder can handle things that tougher grinders could only dream of. The safety options offered include spark deflectors and eye shields. There is some assembly required but the extra protection prevents you from being injured. It also has a high level of support provided the grinder is mounted. The included rubber base mounts prevent excess vibration, as well. The base is made of cast-iron and is very sturdy. It’s the right choice for a rough workshop and you’ll enjoy how well it does its job even when using on tough jobs on a regular basis. The Rikon features a ½ horsepower motor and can reach speeds of up to 1,700 RPMs, making it a great option or a beginner who wants to get into grinders. While it moves at a decent speed, it has a special design to prevent excess heat. This bench grinder has rubber feet atop a cast-iron base which gives stability and control of vibrations as you work. This can keep your hands stable as you work, even when the wheels are running at full power. There are two grinding wheels that come with this bench grinder, each with a different sandpaper grit on the surface so you can select the best one for your sharpening and grinding needs. In addition, the wheels can both work at the same time or individually without worry about wobbling as work happens. This may not be the most high-powered grinder out there, but it will do the job for beginners or those who only occasionally need to do a small amount of grinding. The two wheels make it a versatile option and it comes in at a great price point for those on a budget. This powerful and quiet bench grinder has a whole range of features to make it more useful and convenient to use in numerous applications. 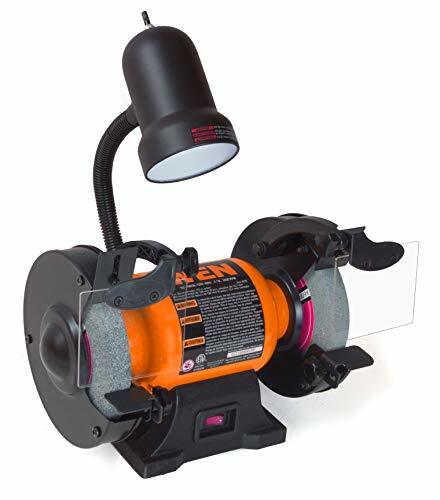 One of the most loved features is the included flexible light, which gives better visibility in a dark workshop. With the inexpensive price tag and extra features, this is a fantastic bench grinder for someone on a budget. 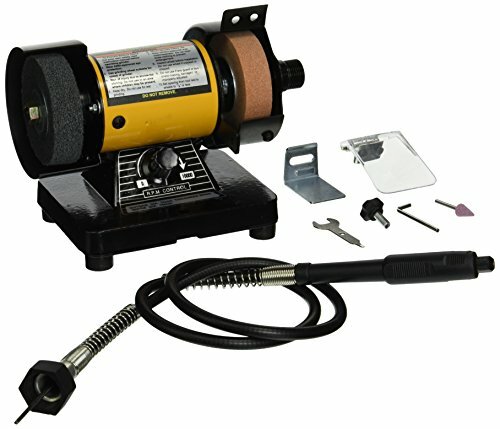 This is a portable and lightweight bench grinder that weight in at only about 16 pounds. Because of that, there’s no reason you have to attach it to a bench and leave it there. Take it with you on any job you have for ultimate convenience. The 4276 has a light includes that can attach right to the durable body. You can move the light in whatever direction you want to give the best position and angle to see what you’re doing in places where light might be at a premium. This bench grinder has a slow-speed motor, which makes it unique in its own right. It offers a reasonable amount of power with a ½ horsepower motor and spins at a speed of 1,725 RPMs. That might make it seem underpowered, but it’s perfect for use on precision jobs that require a delicate touch. Because the motor is slow, that also means less heat is created. The perk of this is that when you sharpen tools or knives, you can use them as soon as you’re done rather than waiting for them to cool down. There are numerous safety features on this grinder, including a locking power switch. This prevents anyone from turning on the machine without meaning to. It also has spark deflectors and eye shields to prevent injury. All in all, the BVGSS8091 is ideal for precision jobs and prevents the worry about high levels of heat. It has numerous safety features to protect you and your family. It also features a steel base for limited vibrations. This small grinder uses three-inch wheels and makes it ideal for certain projects, such as sharpening knives. It has variable speed options that range from zero to 10,000 RPMs so you can adjust the speed as needed depending on what you are doing. The variety of speeds is impressive and appreciated by users. The TruePower 199 Mini comes with an additional accessory, which is a flexible shaft attachment. It’s 31 inches long and can attach to the bench grinder itself. The tip spins which can make it easier to grind areas that are hard to get too. Those who are looking for a budget, small grinder will enjoy that this one measures only seven inches tall and 11 inches wide. It also weighs only seven pounds. This makes it a super portable option to move around the workshop or cart from site to site. This is the ideal compact and portable bench grinder for small jobs like sharpening small tools. With variable speed options and the flexible shaft attachment, it may perform in most areas than you would expect. With a low price, it’s no surprise that it is highly popular. This bench grinder from DeWalt has an extremely powerful motor which offers about ¾ horsepower for even the most difficult grinding jobs. That horsepower amount can crank out spinning speed of 3,600 RPMs which is likely more than enough for most users. Avoiding overloads is important when working on a heavy-duty project, and the DW758 offers just that protection. Many people who own the grinder are surprised by the projects it can handle and appreciate that worrying about overloads can now be a thing of the past. The cast-iron base of this bench grinder is highly durable, and it ensures a long lifespan even when being used regularly. On top of that, it offers tool rests which are created from aluminum. This makes them sturdier and close to perfect for holding whatever tools you need to grind or sharpen. The DeWalt eight-inch grinder has a high speed rating and abundance of horsepower. It is sturdy by use of a cast-iron base and aluminum tool rests which can be adjusted. With these features along with plenty of safety options and overload protection, this is a fantastic option for anyone who wants a larger grinder. The Skil 3380-01 is a six-inch grinder that has rubber feet for extra base stability. Once you mount the grinder, the feet prevent much of the vibration associated with other grinders. You can expect stability throughout use for a more user-friendly experience. One of the extra features with this grinder is the addition of LED lights. These are built in and can be found right above each grinding wheel. If you often work in a poorly lit environment, these lights will make everything a little easier. The motor on this machine is 2.1 amps which leads to grinding wheels that can spin at 3,450 RPMs. This is plenty of power for an average person who is interested in sharpening tools and buffing items for various projects. This is a powerful grinder that can grind, sharpen, and buff most anything you could want. It has high visibility due to the integrated LED lights and includes adjustable tool rests. A sturdy and reliable grinder, it has rubber feet to prevent excess vibration. 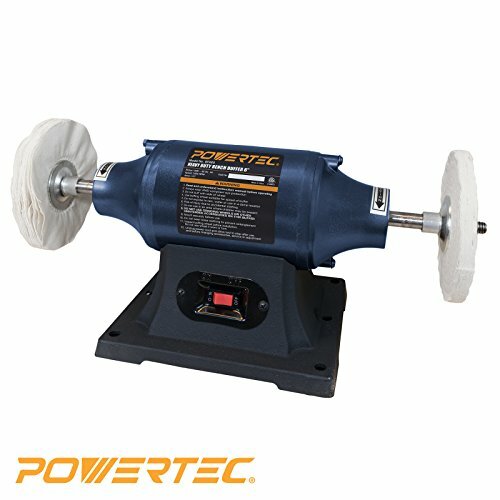 This bench buffer features a ½ horsepower induction motor which offers reliable performance at a fantastic price. It is designed to offer efficient and quick polishing and smoothing of metal or other materials. The grinding wheel is six inches, which is optimal for most home users who want to do quick and efficient jobs. It includes a cast-iron base which gives it a high level of stability when working on projects in your workshop or garage. With up to 3,450 RPMs in speed, this is a must for any precision work being taken on. 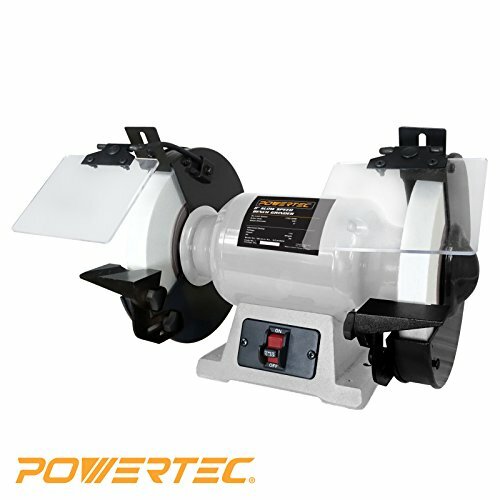 The Powertec BF600 bench buffer is specifically designed for buffing and polishing and makes a great option for those who are on a budget. If you aren’t interested in something flashier, this could be a great companion in your workshop. This is another bench grinder that has variable speed options, which makes it a fantastic choice for all sorts of different projects. You can adjust the speed from 2,000 up to 3,400 RPMs, which offers both low and fairly high ones. Both a 36 grit and 60 grit wheel are included which also adds to the versatility of this tool. There is also a left-hand tool rest with a drill bit rest and two rests that can be independently adjusted to use however you like. This can offer compensation for any wear that occurs to the wheels. This grinder comes with a water tray which can prevent your tools from becoming overheated. It also has a work light that you can switch on and off depending on your needs. It isn’t attached to the grinder itself so it can be used anywhere and whatever way you need. The Delta 23-197 also features a cast-iron base for the steadiness and stability that you want in a high-quality bench grinder. This also limits the amount of vibration you feel like doing work with the tool. There are numerous things to consider when choosing the best bench grinder and having some insight into those things may make it easier to select the right option for your needs. Below are a few things to look for as you do your research. One of the most important things to think about in terms of a grinder is the power of the motor. This can be tricky since the type of work you want to do will have an effect on the power level you want. Those who plan to take on tough work are likely to want the highest level of power, as it can do more and keep up the hard work for longer. Most people will be happy with a motor of ¼ to ½ horsepower for work around the home. However, those who need a substantial amount of power may be happier with an eight-inch grinder with a larger motor. Another thing that is important to consider is the type and variety of wheels that can be used on the bench grinder you choose. Take time to think about what projects you likely will be working on and whether the model that appeals to you meets all the needs you have. The grinder won’t be a lot of help if it isn’t compatible with the wheels you want to use. As a basic idea of what to look for, most people use wire brush, fine grit, and buffing wheels to cover most of the most common projects. When you are sharpening tools or handling other jobs that need a bench grinder, there are many moving parts and dangerous situations can come up. Being safe is something that everyone should take into consideration. When narrowing down your options, be sure to tally up the safety features each of them offer. Eye shields and spark guards can be extremely useful to keep you from being injured while using the grinder. While it’s possible to buy protective gear, it’s always a plus when it comes right with the tool you plan to buy for no extra charge. There is a bench grinder for everyone out there. There are budget options for beginners to learn on, as well as mid-level machines with more features and power. Those who need an extreme amount of power can find it from the more powerful and fast bench grinders on the market. The nine listed here are a great place to start when looking for the best options available today. Good luck!